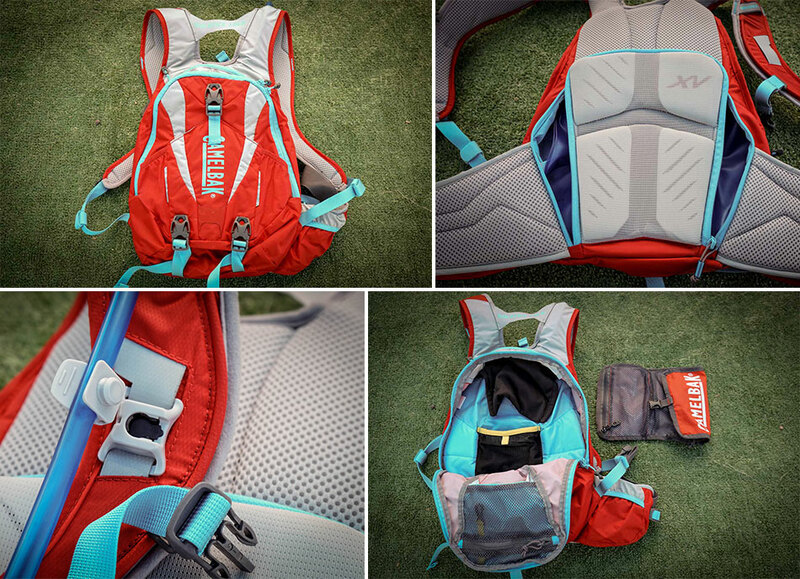 Camelbak’s lumbar packs are now part of their “Lowrider” series, which is all about maintaining a low center of gravity by keeping the bulk of the load over the hips. 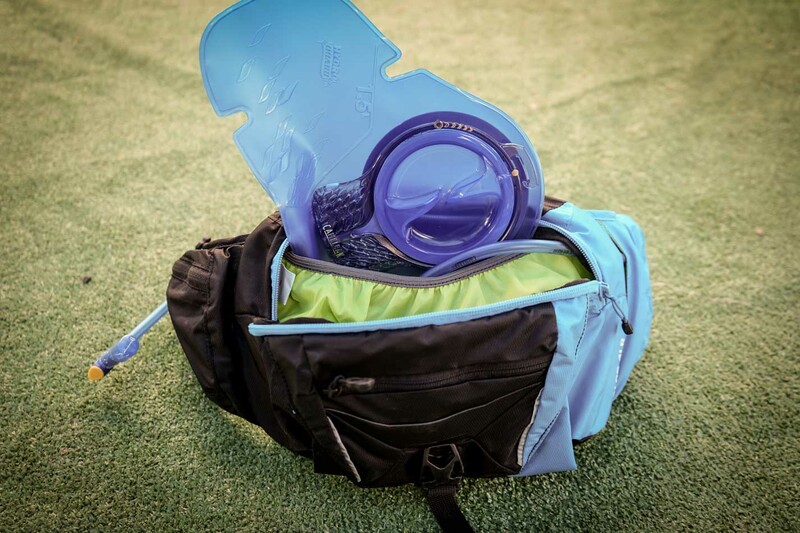 The new 10-liter-capacity lumbar pack called the Skyline (men’s) or Solstice (women’s) carries a reservoir horizontally along the waistline. As the reservoir empties it can be cinched down and stabilized with straps that run from the inside of the pack out onto the waist. Pulling the straps tightens the reservoir to the waist, stabilizing it against the wearer’s back. The hose secures to the shoulder strap with a magnetic ‘tube trap,’ and the pack has external capacity for both a half-shell helmet and light armor. There’s a fleece pocket to keep scratchable items un-scratched as well as a larger overflow cargo pocket which includes a tool roll. The waist straps each have a pocket: one side is zippered while the other is easily accessed via an envelope-style closure. Beyond coloring, the women’s Solstice has ergonomically curved shoulder straps which use a softer Velvetex lining to reduce chafing. Both packs will retail for $130 when they become available in early 2016 and are primarily made of 70D/210D Ripstop nylon. Fanny packs are increasingly popular these days for shorter trail rides. 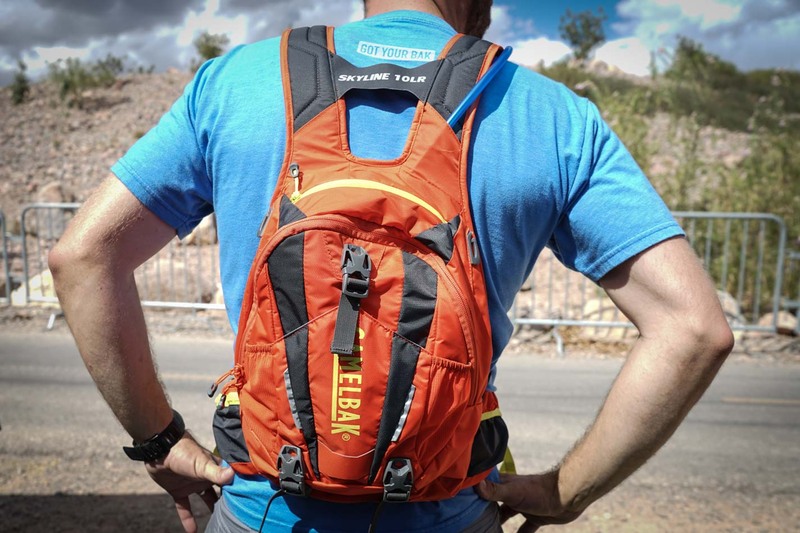 Instead of simply including water bottle carrying capacity, Camelbak designed their Palos pack around a 1.5-liter reservoir that looks a lot like the one used with the Skyline and Solstice packs. The 4-liter Palos is made of the same 70D/210D Ripstop nylon as the Skyline and Solstice packs and uses the same cinch system to stabilize the reservoir. It also features a tool roll that slips into an external pocket and has quick-access storage with one zippered and one envelope-style waist pocket. The tube attaches to the waist with the same magnetic trap as on the lumbar packs. The Palos will be available in early 2016 for $65.